Barua (Bengali: বড়ুয়া Boṛua, Arakanese: မရမာကြီး) is a distinct Bengali-speaking Indo-Aryan ethnic group native to Chittagong Division in Bangladesh, Rakhine State in Myanmar, where they are known as the Maramagyi or Maramagri, and parts of Tripura in northeast India. According to Arakanese chronology, the Barua Buddhists are the ancient peoples of Bangladesh who have lived there for five thousand years. They are commonly identified by their last name, "Barua". Chittagong was formerly known as "Chaityagrama" "town with Buddhist shrines". It was a center of Mahayana Buddhism in the 10th century. Magh was the general term used for Buddhists; Barua's are also termed Rajbansi "of royal descent". They insist that they came from the Aryavarta or the country of the Aryans which is practically identical to the country later known as Majjhimadesa or Madhyadesa in the Pali texts. Bengali speaking Barua people of Chittagong are all Buddhist by religion, unlike Assamese Barua of Assam. Barua came from "Baru" "great" and "arya", meaning "noble ones". A Magh king, Jaychand, ruled the Chittagong region in the 16th century. 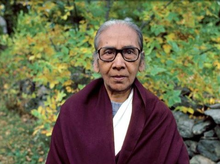 Dipa Ma, a prominent Buddhist master in Asia of Barua descent. The Baruas used to follow Mahayana Buddhism and followed some of the Hindu customs until the mid 19th century when the Sangha Raja of Arakan, returning from Bodh Gaya, visited Chittagong. In the mid 19th century, the Baruas came into contact with Theravada Buddhists from Burma and Ceylon and are now thus mainly followers of Theravada Buddhism. Bauddha Dharmankur Sabha Buddhist religious organisation founded by [Kripasharan Mahasthavir] in Calcutta on 5 October 1892. Kripasharan Mahasthavir was its first president and Surendralal Mutsuddi its secretary. The journal of the Dharmankur Sabha, Jagajjyoti, edited by Gunalangkar Sthavir and Shraman Punnananda Swami, was first published in 1908. It was subsequently also edited by Benimadhab Barua. Anagarika Dharmapala visited Chittagong in 1917 where he influenced a 9-year-old boy, who later became the well known Pali scholar Prof. Dwijendra Lal Barua. This page was last edited on 12 April 2019, at 22:37 (UTC).